You can brew this as weak or strong as you like, really. It is also good chilled. You do not need to sweeten this tea, but a bit of honey added would be ok if you prefer it sweetened. Combine the coriander seeds, fennel seeds, cumin, and black peppercorns in a jar, stir well, and set aside. Bring two cups of water to a simmer. While the water is heating, pound the ginger with the mint to break it up a bit. You can use a mortar and pestle or a wooden spoon or cocktail muddler. When the water is hot, stir in 1 tablespoon of the dry mixture and the ginger-mint mixture. Simmer for 3-5 minutes, remove from heat, cover, and allow to steep for another 3 minutes or so. 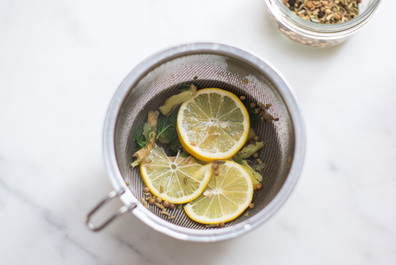 Place the lemon slices in a strainer, and strain the tea through the lemon into a pot or container. Makes 2 cups of tea, with enough of the dry tea blend for another 3 pots or so.